trainers moderation process ensures that this content is properly delivered. These qualifications are accepted by all employers and companies in New Zealand. Make sure you ask for NZQA qualificiations. Click here to find a trainer. Although some specialist older unit standards exist for the electrical utilities, arborculture and horticulture, these are not adequate for general purpose EWP operator training. If you are getting your staff trained it is important to know which type of training is best for you. If you contracted to, or wish to work for a major construction or industrial companies then NZQA Qualifications will be your best option. If you do self accreditation for ACC, NZQA Unit standards will also be your best option. Since the release of the Best Practice Guidelines for MEWP in August 2014, the EWPA has fielded numerous inquiries regarding EWP Operator Training, most questions relate to what the requirements are for such training. The short answer to this question is that the Health and Safety Act informs you that you must train your staff on the equipment they are using. So, even though licensing is not mandatory in New Zealand, machinery operator training most certainly is. 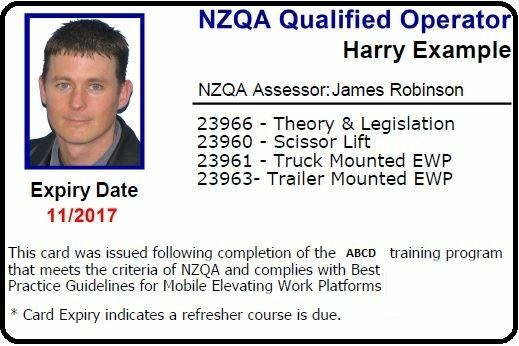 Means of demonstrating competency is by completing an Operator Training Course that provides NZQA Qualifications to the trainee/ MEWP operator. All training courses must cover the requirements of AS2550.10: Cranes, Hoists and Winches – Safe Use – Mobile Elevating Work Platforms and course providers should be able to offer evidence of this. Competency should also be assessed through supervision during the use of the equipment. An MEWP operator must also be able to demonstrate that they have the knowledge and skills needed to do effective hazard and risk assessment in their operating location. At the end of the day, if you have an accident, you will have to prove to a judge that your training was adequate under the Health & Safety in Employment Act. Don't settle for anything less than NZQA Qualifications. If you need training, make sure you use a EWPA member company. Click here for a list of trainers. If you have any questions or need advice in relation to the above, please contact the Association on 07 5752563.